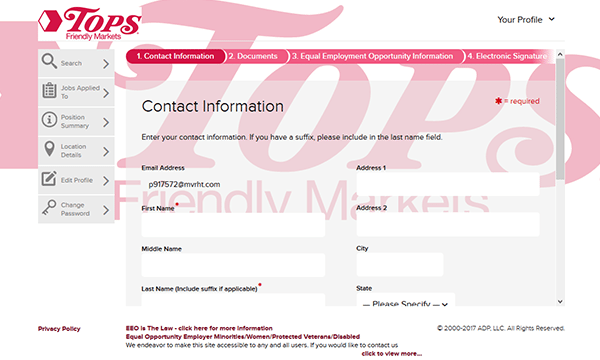 The Tops Friendly Markets job application is only officially available via the company’s careers website. 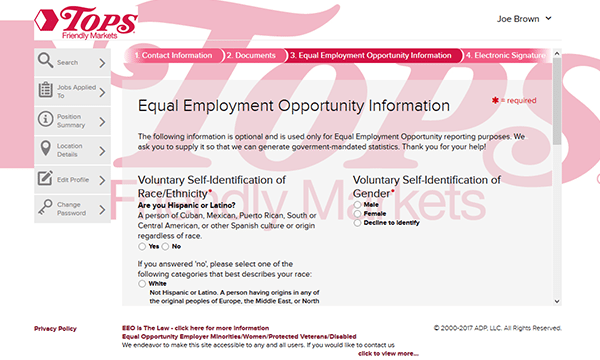 The guide posted in the below section provides an overview on the company’s online hiring process. 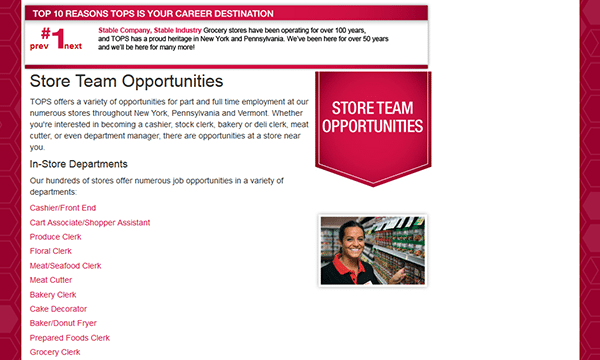 In-store, pharmacy, distribution/transportation, store management, and corporate careers can all be applied for by going to the company’s careers page. About the Company: Tops Friendly Markets is an American chain of grocery stores headquartered out of Williamsville, New York. The company was founded in 1962 and currently has over 170 locations throughout the Northeastern United States. 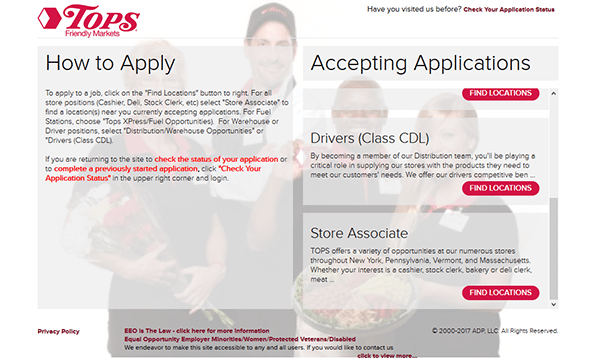 Step 2 – Scroll down the page and click the “Apply Now” button of the job type that you want to start the online hiring process for (e.g. 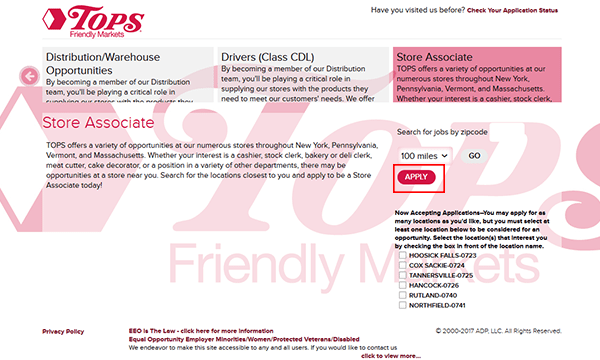 store team opportunities, distribution/transportation, pharmacy, etc.). Step 3 – Press one of the “Find Locations” buttons. Step 4 – Select the location(s) you want to submit an application to and then click the button as outlined in the screenshot. 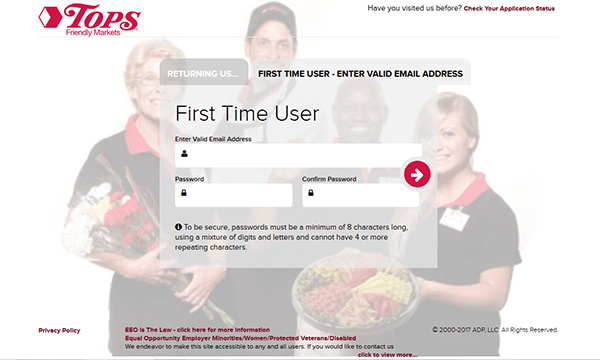 Step 5 – If you’re a first time user enter your email address and then create a password. Step 7 – Press the arrow button to go to the next section of the form. 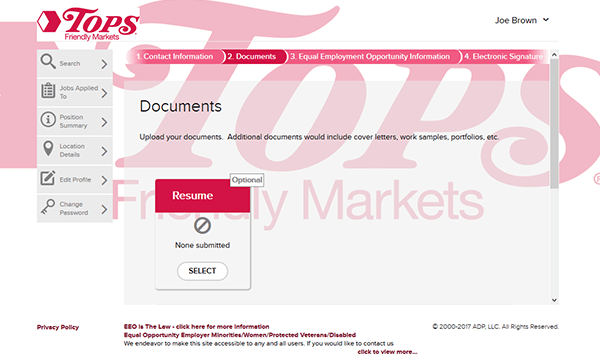 Step 8 – Documents – Upload your resume and any other relevant documents in this section. Provide answers to the required questions. Step 10 – Submit your electronic signature and provide any other required details in order to finish the online hiring process.